This damselfly occurs all over California, and is the most commonly seen damselfly in urban settings. Its perch is horizontal and its wings are held straight back over the abdomen when at rest. Thorax: Pronotum with two lateral black stripes that form an ""urn"". Stripes on the thorax sides are pinched mid-length. Abdomen: Sides of mid-segment have triangles that are small and backwards-pointing; outer segments have black streaks, or the first segment may bear the triangle. Males: A vivid blue, turning lavendar in cooler situations. Segments (last 3) 8-10 are wholly blue, with little or no markings. Similar in females, but color is consistent with whatever is the general coloring. Color of teneral adults is milky gray. Female: Tan or gray with black markings. Adults are aerial predators known to even pluck spiders from their webs. Naiads are aquatic, feeding on aquatic invertebrates, including mosquito larvae. This damselfly occurs all over California, and is the most commonly seen damselfly in urban settings. 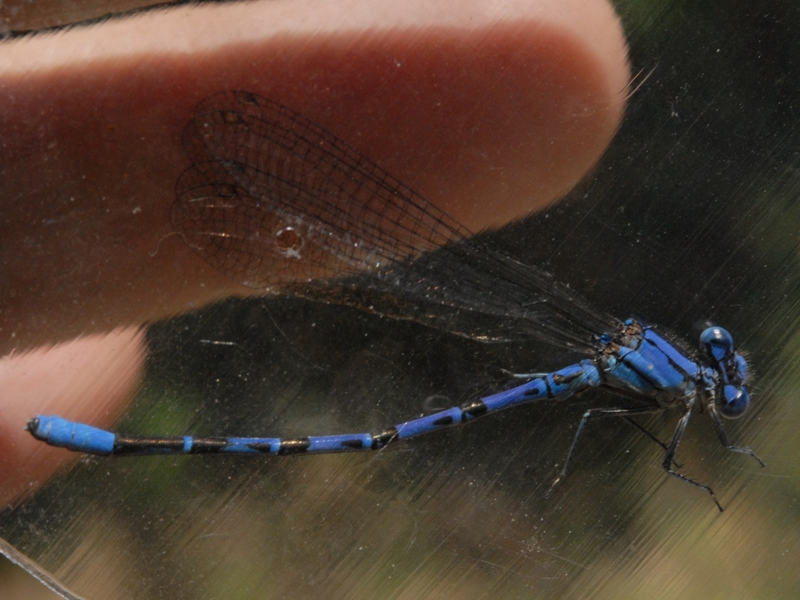 During warm periods damselflies can be seen in riparian areas and far inland from waterways. Throughout western United States and western Canada. Whenever there are prolonged warm spells. Species Argia vivida - Vivid Dancer. (http://bugguide.net/node/view/24800). Accessed March 12, 2016. .
California Damselflies aka California Zygoptera. (http://bigsnest.powweb.com/southwestdragonflies/damsels/2_Zygoptera.html). Accessed July 16, 2016.